PARIS (Reuters) - North Korean leader Kim Jong Un is sincere and really means to abandon nuclear weapons, South Korean President Moon Jae-in told a French newspaper, adding that the international community needed to reward him for that. Kim and U.S. President Donald Trump pledged at a landmark summit in Singapore in June to work toward denuclearization. 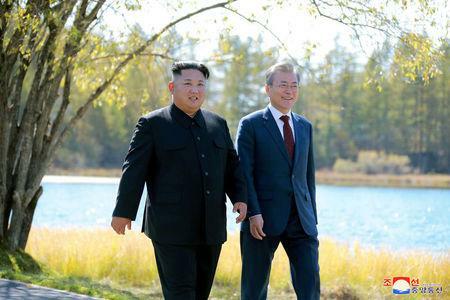 But the agreement was short on specifics and talks have made little headway since, with the North refusing to declare its nuclear weapons and facilities or agree to a concrete timeline. "It is now time to respond to these efforts that were hard to agree to," Moon said. "We need to assure Kim Jong Un that he took the right decision in deciding to denuclearize and we need to accompany him in his wish for a durable and solid peace." "We could also in the future discuss the easing of sanctions, in accordance with progress on denuclearization," he added.